Robbie Symons is the founding Pastor of Harvest Bible Chapel in Oakville, Ontario. His greatest passion is to see Jesus Christ glorified as people realize their potential through His amazing power. With a Spirit-led resolve to proclaim the Word of God without apology, passionately worship His only Son, and believe firmly in the power of prayer, Jesus is building His Church. Harvest Oakville has experienced the power and grace of the Lord in its growth from a Bible study of eighteen people in 2003 to nearly four thousand worshipers today. God burdened Robbie and the church elders early on with a conviction to plant churches. Through much prayer, they have seen the birth of vibrant churches across Canada, including locations in Brampton (2009), Niagara (2011), Toronto West (2013), Brantford (2014), Kelowna (2014), and Ottawa (spring 2016). In 2014, Live in the Light, a radio ministry of Harvest Oakville, began airing Pastor Robbie’s messages in a thirty-minute program that plays in the Greater Toronto and Buffalo areas on weekdays—JOY1250 at 8:00 a.m. and 6:30 p.m., 99.5 WDCX at 11:30 a.m. WDCX also plays the messages at 7:30 a.m. on Sundays. Live in the Light exists to see radical transformation in God’s people through the revelation of God’s truth. 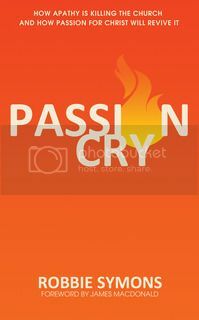 Passion Cry is Robbie’s first book and is already being used to spread God’s message of passion and hope for His people. Q: What is Passion Cry about? A: Passion Cry is about how apathy is killing the church—and how passion for Christ will revive it. A: From the moment I was saved, God gave me a passion for Christ that I need to share. This book presents a simple yet profound message of the conviction and truths that God promises to bless. I believe that many Christians settle for so little, and this has to change. I wrote Passion Cry to expose the gap between where people exist and where the Lord has designed them to be, and to help them, in some way, to close that gap. At the end of the day, I wrote this book in order to steward the calling and conviction that the Lord has placed on my heart about helping people realize their potential in Christ. I am convinced that although this message is not new, it needs to be restated for each generation in a way that they can understand and apply. Q: What do you hope your readers will get out of your book? A: I pray that readers will come away with a true and lasting passion for Jesus Christ, as well as a deeper understanding of the beauty and simplicity of the gospel and the power it holds to transform lives for the glory of God. I pray Passion Cry stirs readers theologically, but at the same time helps them practically, both challenging them and encouraging them as a loving wakeup call to make their lives count while there is still time. A: As a first-time author, I certainly came to the process with more questions than answers. I have enjoyed working with WAP and found them to be professional and helpful along the way. There are always certain things you would do differently if and when you were to do it again, but I have been encouraged by the relationship and promptness of working with WAP. Q: Would you tell us about your writing process/style? A: I am a preacher before I am a writer, so that influences how I communicate. My writing process is similar to the research I do for sermons. I immerse myself in the Word, and through much prayer move forward only as God prompts. I outline, add details, and write the text how I would preach it. Afterwards, I clean it up, making it more suitable for print. My writing style is conversational and personal. A: As a new writer, I am still learning myself, but I would encourage other writers to first put their heart and motives clearly before the Lord and allow Him to have the final say and direction. I would encourage new writers to give themselves a chance, to write down their thoughts liberally, express their heart, and see what comes together. Passion Cry spanned several years and involved many ups and downs. There were many times when I thought it was ridiculous to try and write a book. Yet by God’s grace, here we are: the book is published and the early response has been quite encouraging. Free Indeed 2016 (Men’s Conference), Harvest Bible Chapel, Oakville, ON. February 5–6, 2016. Men’s Conference, Harvest Bible Chapel, Chandler, AZ. February 13, 2016. The Well Conference, Harvest Bible Chapel, Hickory, NC. February 19–20, 2016. National Renewal Conference, Denver, CO. September 28–30, 2016. Robbie will be on the radio in the Toronto/Buffalo area (99.5 WDCX) with Neil Boron for an hour-long interview on Thursday, February 4, from 4:00–5:00 p.m.
Keep an eye out for Robbie’s next big project, a book on the power of prayer! Robbie Symons is the founding pastor of Harvest Bible Chapel in Oakville, Ontario. Harvest Oakville began as a humble Bible study in 2003 and quickly grew into a church of 3,500 that has planted several daughter churches across Canada. Robbie can be heard on Live in the Light, a daily radio ministry covering southern Ontario and western New York, and is a frequent guest on 100 Huntley Street. He and his wife, Gillian, have four children and live in Burlington, Ontario. For more information about Robbie, visit www.harvestoakville.ca or www.liveinthelight.ca.